Dastarkhwan e Awadh ~Lip Smacking Lucknow Cuisine!! It was one of those irresistible invites !! that I would keep aside everything for ; the promise of authentic cuisine of the Nawabs, in company of people with a shared passion for food and travel and in absolutely great ambience. 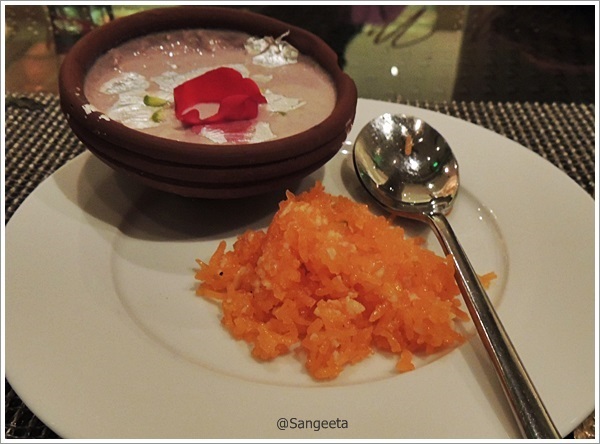 Before you guess further, it was an invite for Holiday IQ Community Event in Marriott Bangalore over Dastarkhwan e Awadh (Lucknow Cuisine). 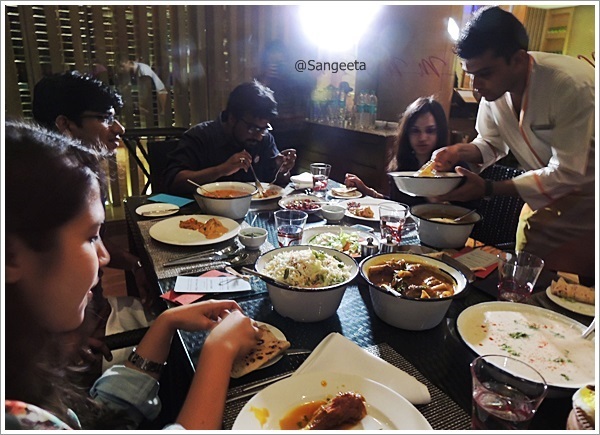 We were a team of 15 travelers and after a quick introduction and walk through of the hotel and a peek into the kitchen, we settled down by the courtyard to dig our way through a 4 course spread that promised to be as ethnic as ever !! The lamps were lit, the tables were set, the delicately flavored fiery red Rooh Afza poured into glasses while the sudden splash of evening showers created the perfect melody for a promising evening ahead. 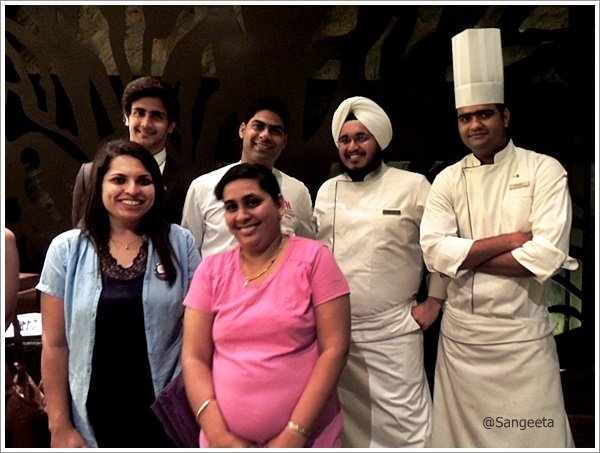 The chefs’ took centre stage regaling stories of each dish on the menu while the starters were being served. 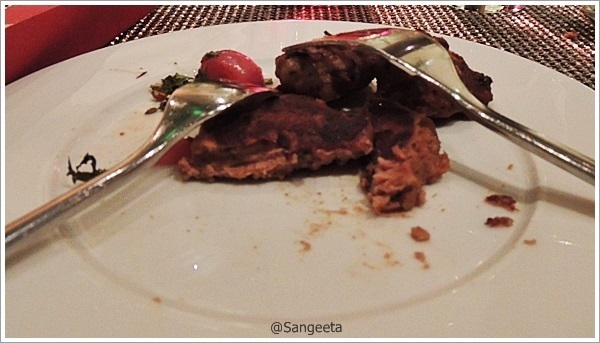 Gilawat Ke Kabab and Gosht Ki Tikki were both made of minced lamb, looked slightly similar but tasted remotely different. While the kabab melted in my mouth, the tikki gently opened my taste buds. Over years, the Kabab and the Tikki who were distant cousins (having originated in different countries) have become brothers in arms. The Kabab is essentially made from coarsely minced meat and cooked on fire, while the Tikki can be a solid chunk of meat or minced meat but cooked in a pan. The Gilawat ki Kabab is an ode to the last of the Nawabs, the aging Wajid Ali Shah of Awadh who was a connoisseur of good food and urged his Khansama’s to prepare delicacies to suit his age and toothless state. Needless to say, the picture of the kababs is an after thought since I had already gorged myself but I must make a special mention of the onions soaked in vinegar and tempered with whole coriander that stole my heart !! The main course comprised of an awesome spread of Pulaos, Paratha and unique Curries. I started off with the traditional Roomali dipping into the unique Lagan ke Bater. In Lagan ke Bater, the quails were slow cooked in Dum Style with Almonds and Pistachios, seasoned with generous amounts of saffron and cardamom allowing the flavours to blend in perfectly. 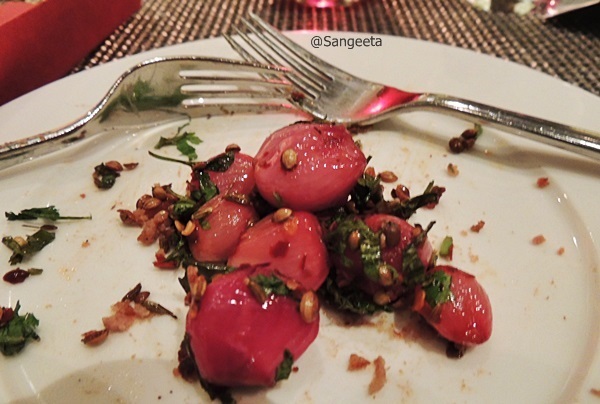 I helped myself with a spoonful of the tangy Dal Sultani which was smoked with betel leaf. The red lentils were cooked to a paste in yoghurt and thickened with generous amount of cream. Before I made my may to greet the Princess of the evening, I paused for a minute with Gobi Musallam. The cauliflower was cooked right but the gravy was a cross between the quail and the tangy dal that I had already savored. The Princess emerged from the saffron flavored purdah, dressed to sweep us off our feet. I cut through the giant slice of Murgh Khusk Purdah on my plate as the aroma drifted around the table. It melted on my tongue and the juices filled my mouth leaving a distinct after taste of star anise and perhaps pomegranate !! I had a bite with Pulao and then another with the Paratha. 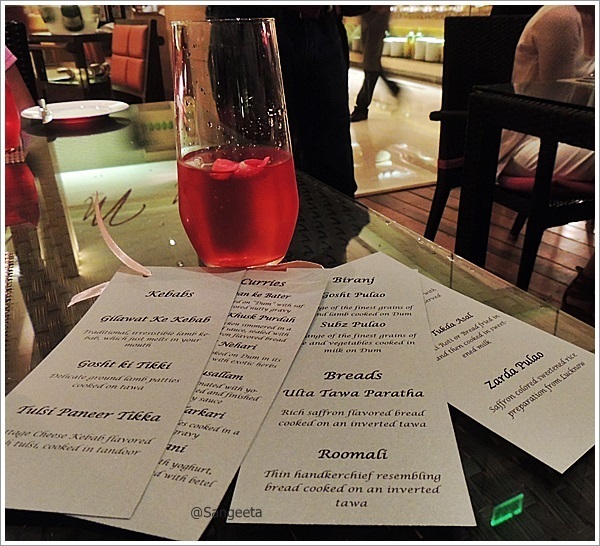 I was toying with the thought of moving over to the sweet dishes when the irresistible Prince Nalli Nihari beckoned. Succulent pieces of lamb shanks cooked in delicious spices stared back from the pot and I am glad I gave in. Sometimes, a breakfast dish had at dinner brings out a completely different flavour. I cut through the meat, and slowly chewed the already slow cooked Nalli Nehari, sucking on the juices and enjoying every bite. Meanwhile, the sweet dishes made their way to our table and I alternated between the Gulab Ki Kheer and the Zarda Pulao. While the delicate pink Gulab ki Kheer cooked with fresh rose petals left an after taste in the mouth, the sweet saffron Zarda Pulao was just what I was looking for. 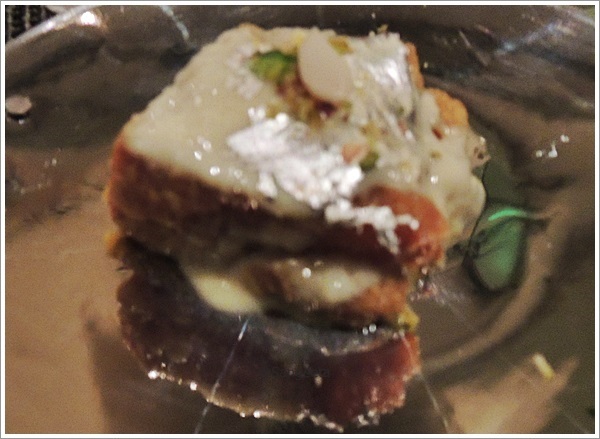 I typically shy away from all kinds of bread sweets but one bite into this Shahi Tukda and was glad that it was not horribly sweet like its Hyderabadi counterpart Double ka Meetha. I burped my way back, driving through cool pre-monsoon showers of Bangalore, after a wonderful evening with great food and engaging conversation. Everything that evening was cooked with lots of Fursaat and generous amounts of Mohabbat which amply reflected in the taste !! Thank You Chef Raheel and team for the wonderful spread and Holiday IQ for a great evening recreating erstwile Awadh in taste and spirit in a far away land !! A big Thumbs Up to these community events and the people who work tirelessly behind the scenes to make it happen ! !